I want to start off by thanking those who donated towards our winter fundraising campaign to support The Commons. I am always in awe when God’s people dig in and support the work! There have been some amazing things happening recently that have just been a joy to be a part of. 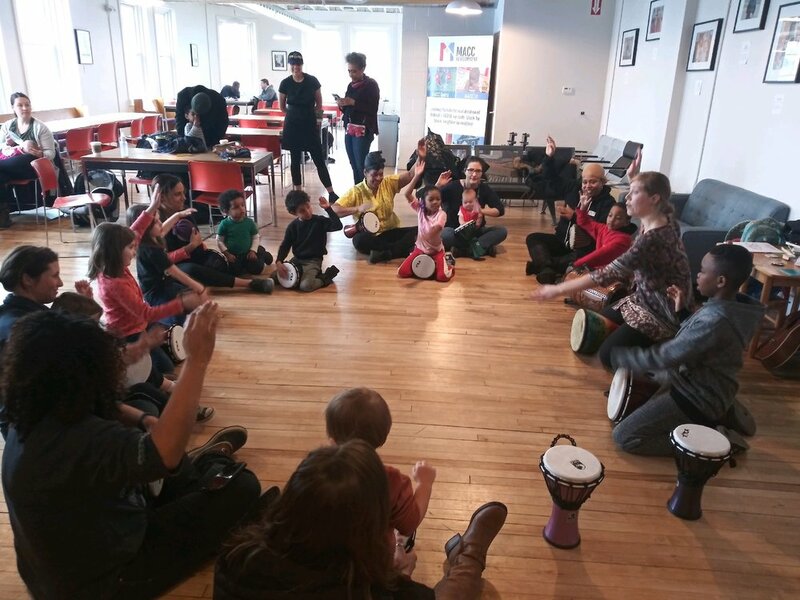 First, MACC Lit was finally able to relaunch Parent and Child Together time since moving into our new building and held a Black History Month Story Time where our little ones learned traditional African dances and got to partake in a drum circle. Second, MACC Sports hired an amazing Director in Roger Waldon II, who has quickly found ways to engage our youth through a 3v3 Basketball tournament, Speed and Agility Camp and is preparing for the both Spring Soccer and a new Flag Football League! Third, even in the cold weather we’ve been out in the community with volunteers from Cornerstone and Waynesburg University as we look forward to host more mission teams this summer. We’re also preparing to host the much-needed Property Tax Exemption workshops again this year. Last year, MACC Development helped 158 Homeowners in the 48214 receive property tax exemptions! And Finally, this past weekend we were blessed by God’s goodness to be able to have The Commons 1 Year Anniversary Party! The Commons has been a true beacon of hope in our community and has also won multiple community awards. God is so good! It is with also some great sadness that in January I announced that I would be stepping down from the role as Executive Director in August 2019. Since joining MACC Development in 2016, I have gained valuable experience, meaningful relationships, and—most importantly—a deeper understanding of just how big our God really is. From my first day on the job, I was impressed with the determination of our team. We moved fast and accomplished the incredible despite working remotely for years. We pressed forward with the $1.5 million renovation of The Commons. We found new homes for MACC Lit, launched a new basketball league for MACC Sports, and partnered with the city to revitalize Pingree Park. Looking back, it is amazing to see God work through this team. The awards and media recognition we have received are testaments both to His faithfulness and the innovative leaders and advocates I have worked alongside these past three years. Furthermore, without your support and without God's unmerited favor, none of what we have achieved these past eight years would have been possible. And so, even as we face another challenging year, we remain undaunted. Indeed, we eagerly anticipate the year to come, mindful of the many years of God's faithfulness to us and to our neighbors. This has been an exciting and busy winter for MACC Sports. We started the year off with an awesome basketball camp and 3 v 3 basketball tournament; facilitated by the staff and players of the Northpointe Christian High School Basketball Program (Grand Rapids). We were also blessed with tickets, t-shirts, and food vouchers for two Pistons Game. Special thanks to Andre Drummond and Ish Smith for providing the ticket packages. The Pistons are undefeated when we attend their games; maybe they should send us tickets to all of their playoff games so we can win that NBA title this year, hint hint. This year we also got off to a great start with our new Speed and Agility Camp. Our youth were excited to work out their bodies in the gym, their minds during math prep, and their hearts during bible study. Please keep our youth and our coaching staff in your prayers as we continue to help push them to new heights. Registration for soccer and flag football is now open. We are looking forward to another great season as we add flag football and “Soccer for Success” to our programming this spring. Our “Soccer for Success” program will teach youth ages 9-14 not only how to be good soccer players, but they will also learn about healthy living and how to prepare for high school and college. We currently have 3 college tours scheduled this year (University of Michigan, Michigan State, and Jackson Community College) for participants. If you are interested in volunteering and joining us for an awesome spring season visit https://mackave.galaxydigital.com. As always keep our staff, volunteers and especially our children in your prayers. It's been so much fun watching our little ones explore, learn, and grow, during Parent And Child Together Time (P.A.C.T.). This is our program for newborn to 5 year olds and their parents. Throughout the educational hour, we encourage the children to move freely around the room and engage in activities that peak their interest. Our job is to guide them through the learning process, while allowing them to choose their work, independent of direction. February was a cause for celebration as we hosted our first Black History Month Story Time Festival at MACC Lit. The community turned out to hear stories, learn about Freedom quilts, and participate in a drum circle and African Dance class. Join us for Story Time, at MACC Lit, on Wednesdays, from 12 p.m. - 3 p.m. or tutoring, on Tuesdays and Thursdays, from 4 p.m. - 6 p.m.
Enrollment, for the 2019-2020 school year starts in May. Summer camp registration opens next month. The winter season gives us all an excuse to hibernate - to stay in on cold afternoons and put off laundry until the snow lets up. The mood at The Commons has reflected this tendency for a few months, but now as everything is thawing we’re coming back strong with a new line of sandwiches, salads, and breakfast sandwiches, as well as launching a drop off laundry service. We’ve got a honey cinnamon latte on the menu, too. Really, there’s too much to summarize - its worth a visit to experience everything that has been going on. As we celebrate our one year anniversary (what?!?) it’s exciting to look back over all the customers we’ve been able to serve, the conversations we’ve had, awards we’ve won, the difficult moments we’ve grown through and all the jokes and puns our staff shoots back and forth. Some of the most rewarding moments are those when we see folks interacting who wouldn’t otherwise have the shared space to do so - sharing stories, attending meetings, and sharing their talents at open mic nights. A big thanks to all of our customers and supporters over the past year! It’s a pleasure to be able to serve you week after week. In the last couple of months, I have been working hard to recruit mission teams and interns for the spring and summer. To help spark interest from churches and organizations, this March I've scheduled several teams looking for a one-day volunteer opportunity. In January, Cornerstone University visited MACC Development with staff and international students who are business and social work majors. I gave them a tour of our building and of the community. I had several speakers from the community share with them how living in Detroit has impacted their lives. They had an awesome time. I am hoping they will like what they see and will want to come back and do a week-long program with us. Please be in prayer about teams who are still considering a trip to Detroit this Summer. It brings me great joy as I look forward to celebrating Christmas remembering God’s faithfulness in opening The Commons this year in our neighborhood! Hundreds of times a week we have neighbors stop in to do their laundry, grab a warm cup of coffee or simply share stories of what Mack Avenue used to be and their hope of what it will be again one day. As a MACC Development supporter, you know how hard we fought over the last five years to turn what was once piles of dust and old furniture into a place reborn as a beacon of hope and faith. That is why I am writing to you today. While The Commons has been welcomed with love and support from customers and generous supporters like you, it has not been without some difficulty. Since opening our doors we have unfortunately experienced two separate power surges that not only caused us to close our doors for a few days but also damaged valuable equipment. As a small business operating in a neighborhood where few would dare open a business, these losses in revenue and large, unplanned maintenance costs have put The Commons in a difficult financial position. While we have used your support thoughtfully and opened the first new business on Mack Avenue in 30 years, hired 100% of our staff from the community, and won various design awards for our beautiful, inclusive space. You can help us by sending an urgently needed contribution. Our goal is to raise $15,000 ($4,500 which will repair the five broken washing machines, $5,500 to install a surge protector that will safeguard us in the future and $5,000 to help The Commons regain its financial stability). Your investment of $25, $50, $100, $500, $1000 or more will directly support our efforts to create a beautiful community space for neighbors and newcomers from across the region. Your contributions help to make so much good happen at MACC Development – from sports to literacy to legal services. Thank you. I hope you will continue your commitment to The Commons by making a generous gift to MACC Development today. All gifts are tax deductible for this year if received by December 31, 2018. In a new, small business, there is rarely a week that goes by that isn’t spectacular. The Commons has won awards, had a power outage that crippled the business, and been able to serve thousands of customers over the past few month. As a staff, we take the most joy in the small moments such as when our customers run into classmates they haven’t seen since high school, or others still walk into the space for the first time and marvel at the peaceful and welcoming atmosphere. Being that space where MACC Development interfaces with the community means that we get to walk through life with many of the regular customers who come through. In October we were one of ten new businesses in Detroit honored with the Commerce Deign Award, showcasing business that not only were design-forward, but also that reflected and promoted its surrounding community. While many of the winners are located in Midtown or Downtown, we were in the minority by being out in the neighborhoods, which is more rare of successful development in Detroit. Through the month of December we’ll be offering our festive peppermint mocha - yet another reason to visit The Commons and experience everything that is happening in our community first hand. It's hard to believe that 2018 is coming to an end. Our MACC Lit students are preparing for Christmas Break and we're getting ready for the beginning of a new semester. In 2019, we'll usher in the start of P.A.C.T. (Parent And Child Together Time) and Play + Learn. P.A.C.T. is for children newborn to 2 years of age. Parents and children attend this fun-filled hour, together. Age appropriate and self-directed learning centers. Reading, crafts, playtime and snack provided. Preschool readiness, training, and resources for parents. Play + Learn is for preschoolers 3-5 years of age. Children do not attend this program with a parent as Play + Learn works to foster social development and help children learn to relate to one another. We believe that children experience so much through play and creative approaches to learning. We'll come alongside them and pair teacher-directed learning with developmentally suitable curriculum, snacks, crafts, and reading. We'll also open our doors, in 2019, to parents and children who would like to use our children's library or drop in for story time. Hours will be posted, in January. We are eager to partner with you, in prayer, as we look toward the start of the New Year and get our programs off the ground. Please pray for the MACC Lit staff and volunteers, as we seek the Lord's direction, and pray for the children and families who are served by our ministry. Thank you for your continued support. 2018 has been filled with blessings! I pray the Lord blesses you abundantly. This November we hosted a team come from Toronto, Canada! Christian Centre Church spent two days with us. They did an amazing job helping clear out three alleys in Pingree Park and cleaned the entire Mack Avenue Community Church building. They all had such servant hearts and were awesome to be around. What I am most excited about is that Christian Centre wants to partner with us in some capacity in the new year as well. Pastors Olu & Trevor from Christian Centre Church are very passionate about continuing this relationship. I have shared this Pastor Leon and have discussed a possible trip to Toronto to visit the church and their community in the hope of strengthening our bond and encouraging each other in the faith. We have also been building a relationship with Cornerstone University in Grand Rapids, Michigan. Matt Wallace who teaches at Cornerstone and is associated with Friendship Sports International is friends with Pastor Eric and Sarah Russ. Matt and his family really believe in what MACC Development and Mack Ave Community Church are doing here in Detroit. He has made it his mission to get Cornerstone Students out off their comfort zones and show them what we are doing here as well. Matt Wallace, his family, and students from Cornerstone University have been making day trips here once a month since the Spring. He is hoping to build momentum so that perhaps during Spring Break or Summer of 2019, Cornerstone will send a group of interested students to Detroit for a week-long missions trip. If you are interested in schedule a day, weekend or week-long trip with MACC Development simple send me an email at charles@mackave.com. Summer is coming to a close and fall is quickly approaching. The leaves are changing colors, the sun is setting sooner, and the mornings are growing cooler. This change in season ushers in new beginnings at MACC Lit. It signals the end of another successful summer camp and the start of a new school year. Camp was a lot of fun for our young campers, interns, mission teams, and staff. We played endless games of TAG, ran countless relay races, went on big adventures, and survived weeks of temperatures hitting the upper 90's. This year's theme was the MAKER FACTORY where we learned just how fearfully and wonderfully made we are and that we were not only created by God, but we are built with a purpose! We hung out at the Detroit Zoo. We explored the Michigan Science Center. And we discovered the many wild animal habitats, located in our city, at DNR Outdoor Adventure Center. 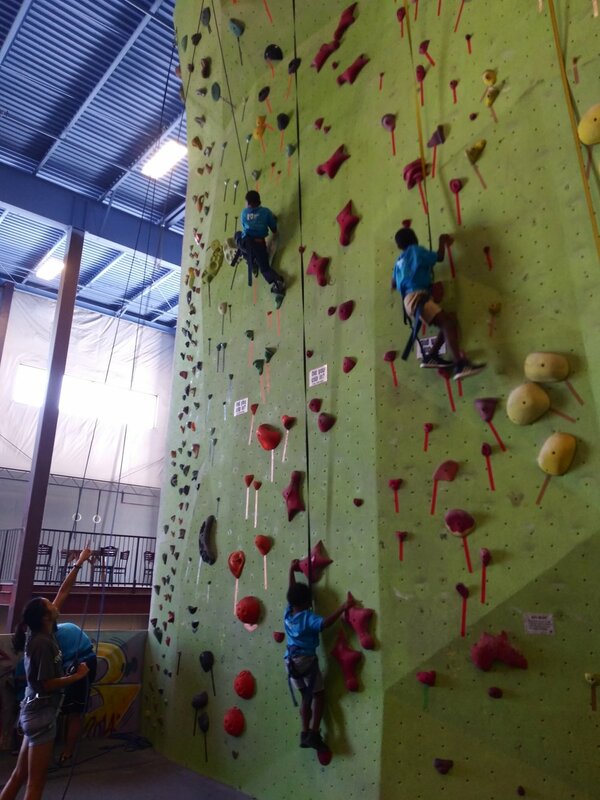 We climbed the rock wall at Planet Rock and participated in daily activities that helped us tap into our creativity. Before we knew it, our campers were headed back to school and we were planning MACC Lit's Fall 2018 Semester. This summer was a whirlwind. It came and went so fast. But, we felt the presence of our God in all we did. Tutoring begins Tuesday, October 16th and is located at 7900 Mack Avenue. Sessions are held every Tuesday and Thursday from 5-6 p.m. We're excited and looking forward to seeing new and returning students. Literacy tutors are needed and will be trained to work with students in K-5th Grades. Availability both days is not required. Contact Alyce Hartman at alyce@mackave.com or (313) 732-9302 ext. 702. for more information or come join us, for coffee, on Wednesdays, from 5-6 p.m. to learn more about the program. Please keep the MACC Lit staff, tutors, and students in your prayers. Pray for our safety and that the Father provide the continued resources and volunteers. The Commons is being established as a peaceful, welcoming place where the whole community can gather. Its been a blessing to see folks still excited when they enter for the first time. We’re also pushing forward by adding more signage on the outside of the building, adding items like bagels to the menu, and offering coffee and food catering to groups that are using the upstairs event space. We've even left the building a few times in order to serve coffee at community events. As we move forward, pray that The Commons would see an increase in foot traffic to both the laundromat and café, and that we could continue serving customers well with the resources we’ve been given. Check out this Detroit Public Television piece on The Commons! This summer was a wonderful learning experience for me in my new role as Director of Missions & Recruitment. I had two amazing Interns in Roland & Mattie who I can honestly call friends. As much as they learned from me, they also taught me. From our time I have seen how I can make our internship program better. I want to make sure we as an organization help them grow interpersonally as well as spiritually. With the help of the interns, MACC Development hosted two mission teams this summer. Cleveland Chinese Christian Church from Cleveland Ohio and Grace Life Community Church from Bristow Virginia were the first groups to stay in our new missions room. They had a great experience being in our community for a week. They really enjoyed being able to spend more time with those from the community during dinner and during our teaching/discussion times. I am now prepping for next summer by recruiting churches and other organizations to choose MACC Development and Detroit for their Missions Trip destination and recruiting interns. We are gearing up for the Summer Mission Team Season. As a precursor to the week-long Summer teams, this Spring we have hosted one-day mission trips from High Schools, Colleges, and churches. Some from Cornerstone University in Grand Rapids MI and the University of Michigan from nearby Ann Arbor, MI. Some have come as far as Kings High School in Seattle Washington and Christian Centre Church in Toronto, Canada. We have had a total of 88 people from 5 different organizations do Missions here in Detroit. This will set us up to have an awesome Missions Summer. We are also excited to have two interns coming this Summer. One is a student at the University of Michigan and the other is a high schooler from Virginia. If you looking to get involved this summer with MACC or MACC Development through are many volunteer opportunities just visit www.mackave.galaxydigital.com it's our new volunteer website that makes it fast and convenient to serve along side us! The Commons laundromat and coffee shop is in full swing! We’ve been working diligently over the months towards this moment, and its exciting to have finally opened our doors to the community. Its encouraging to see folks from all walks of life getting drinks and fresh food, using the washers and dryers, and using the space to work and to meet with friends. It would be easy to talk at length about the last few months, but this space is something that needs to be experienced. If you haven’t yet, we welcome you to visit The Commons. As we enter the summer season, pray for effective marketing and increased traffic as we continue serving the neighborhood. It is mid-season for MACC Sports Spring Soccer. There are 12 teams, 14 coaches, and 138 participants this season. It is a blessing to have so many families participate this season. The shipping container that is housed on Pingree Park has been a great asset to the program and made set up and tear down easier. Please pray that the families will come to know Christ as Lord and Savior and that coaches will lead with humility, joy, and grace. Pray that as we open registration for On Goal Soccer Camp and Volleyball Camp, that finances and transportation would not be a hinderance for any interested participant. MACC Housing recently completed a massive outreach to 1,671 homes in the 48214 to provide resources and information for homeowners and renters behind in their property tax payments and/or facing foreclosure. Our door to door canvassing started in December 2017 and completed March 2018. The outreach effort was supported by The Neighbor-to-Neighbor Tax Foreclosure Prevention Grant and training from the United Community Housing Coalition (UCHC), . Edythe Ford, our Director of Community Engagement and a team of 48214 residents hit the streets to talk one on one with our neighbors. We shared information about lower-interest payment plans, renters’ rights, and the Property Tax Exemption available for low-income homeowners. We also had the opportunity to discuss the new home buying plan for renters who are facing eviction because of tax foreclosure by the property owners. All residents where directed to UCHC or U-Snap-Back for further assistance and legal help. We had the blessings to talk to over 800 long-term residents and get an assessment block by block on the services needed for our neighbors. We talked to many renters who had no idea their landlords where delinquent on property taxes. The majority of our neighbors, homeowners, and renters expressed gratitude for the information they received, many did not know there are options for them to stay in their home. Most residents where already on a payment plan or had successfully completed it. We are grateful to the UCHC for supporting our residents with resources and information to help them from being displaced out of their homes, we cannot afford to lose one more neighbor. The experience helped us learn how important it is to take time and talk to people one-on-one, we are happy we haven’t lost that culture in the 48214. Although going door to door may seem like a small act, we have learned it’s the fuel which binds neighbors together and creates unity and civic pride. The 48214 still stands strong with long-term residents, our friends and neighbors sticking it out to keep their homes. Don’t move, reach out, there are resource to help. Over the last few months we prepared for and kick off our 2018 MACC Sports Basketball League for the second year in a row. It has been such a blessing to host the league at People's Missionary Baptist Church. With over 30 participants and 7 coaches this season it has been a success. The Detroit Pistons donated money to purchase brand new basketball hoops. It is delightful have quality equipment to promote value and worth in our participants. Although MACC Sports Basketball is only halfway through the season, preparations for the spring soccer season have begun. All new equipment will be purchased for the upcoming season with grants and donations since the MACC Sports trailer was stolen last October. Quicken Loans and Project Evergreen are also working with MACC Sports to continue renovations to Pingree Park. It is believed that the park can be transformed into one of the best parks on the east side of Detroit. The second round of renovations will begin in June. Please pray that families will be blessed by participating in MACC Sports and see staff and volunteers who model Christ. These past three months have been a wonderful time of learning for me as I prepare to lead a team, run a business, and serve a community. It has also been a time of transition from primarily sitting behind a computer planning the systems and creating spreadsheets, to preparing the space and meeting all the folks who poke their heads in. With each visitor I’ve been able to share in their enthusiasm about a laundromat and cafe here in our neighborhood. Its difficult to sum up all the change that has taken place over the last few months, as well as all the amazing people who have contributed their time, resources and creativity to this project. I invite you to experience it first hand as we open our doors to our community and the world! Please continue to pray for The Commons to be a profitable business and to spark other neighborhood-focused businesses along Mack Ave. Please also be in prayer for the staff of The Commons, that we could care well for everyone who comes into our space, and that God would be glorified through our actions.